Fanendo Adi gets his final log slice as a Portland Timber. Goodbyes are never easy no matter how many times we encounter them, and most of them aren't even close to the storybook variety that gets portrayed in television or movies. It's rare to leave something on your own terms and do so in a truly memorable way, but it does happen from time to time. 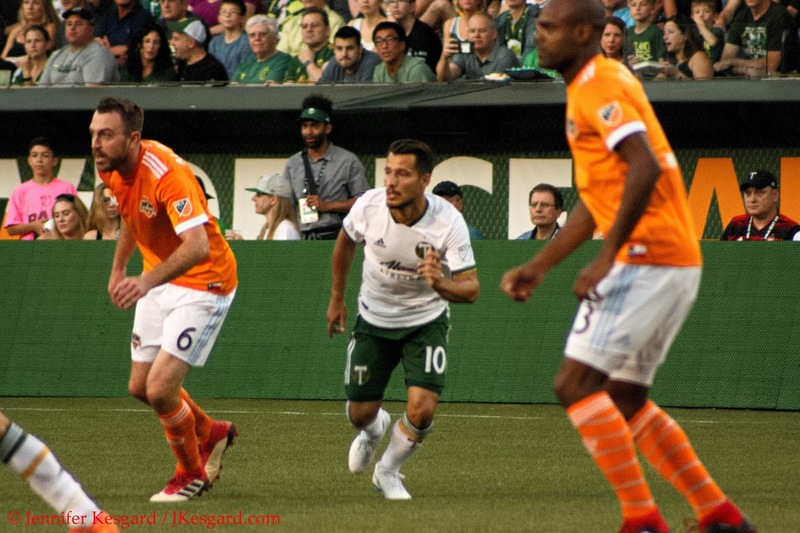 I watched one of my sports heroes, quarterback John Elway, leave football on his terms after a Super Bowl win in 1998, and on July 29, 2018, I was witness to something incredibly similar in the Portland Timbers' dramatic 2 to 1 win over the Houston Dynamo. 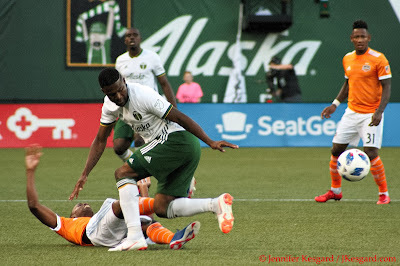 Forward Fanendo Adi, currently sitting in second place on the Timbers' list of all time scorers in goals with 53 in 102 matches played, handed in a transfer request earlier in the week. With forward Samuel Armenteros dealing with a back injury during the week and young forwards Jeremy Ebobisse and Foster Langsdorf playing for Timbers 2 down in Los Angeles earlier in the day, the Timbers turned to Adi to fill their game day roster. Word had broken before the kickoff that Adi was being traded to an undisclosed team, which potentially lessened the chance he would see the pitch against the Dynamo. 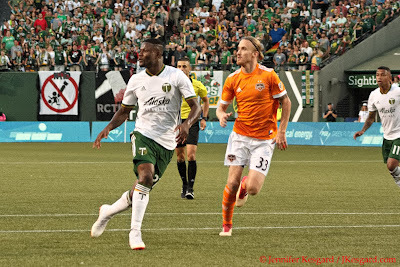 However, Savarese brought him off the bench in the 75th minute, and in something out of a movie script moment, Adi tallied the winning goal in what is likely his last match wearing a Timbers crest. It couldn't have turned out any better for the home side in what turned out to be a very tense and emotional match, but the result did extend the Timbers' unbeaten streak in MLS league play to 14 consecutive. Emotions on the club have been heightened after an emotionally draining 2 match series with LAFC down in Southern California 2 weeks ago followed by a home draw with the Montreal Impact, but things compounded three days ago when Adi, who has been supplanted in the starting lineup by the emergence of Armenteros, asked to be traded from the Timbers. 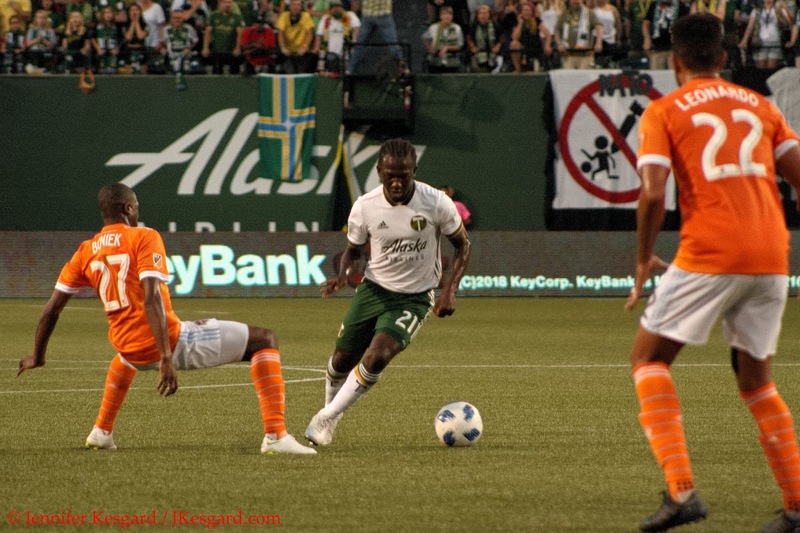 Adi had made a similar request years ago, but Portland indicated that Adi was under contract and wasn't going to move, but this time, the Timbers issued a statement to indicate they were exploring options for Adi. 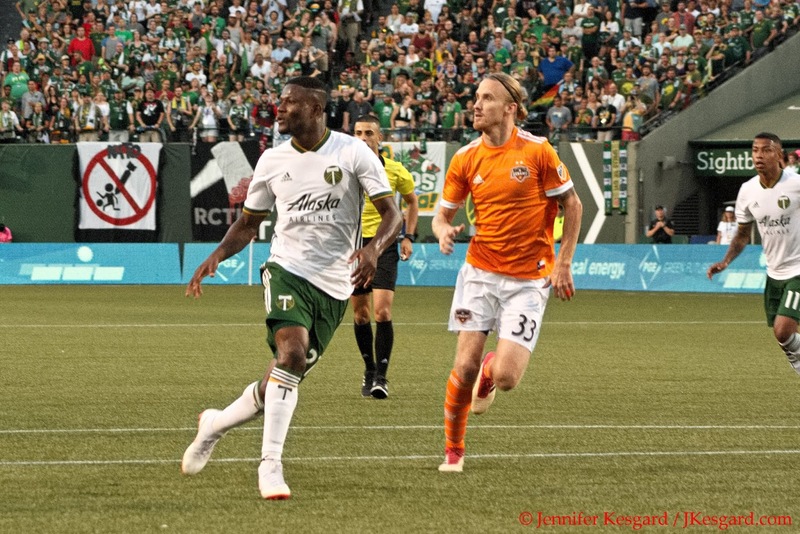 With Armenteros scoring goals in rapid succession, Adi's playing time had been limited to a start versus Sporting Kansas City on June 9 and substitute appearances against Los Angeles on June 2 and San Jose on July 7 at home. With Fanendo being a designated player with a large contract and the summer transfer window open, Portland had a chance to upgrade their roster while also finding a solid landing spot for Adi, who has been with the Timbers since joining them midseason in 2014 on loan, and he impressed them enough at the time that they purchased his contract as the team's primary scorer. 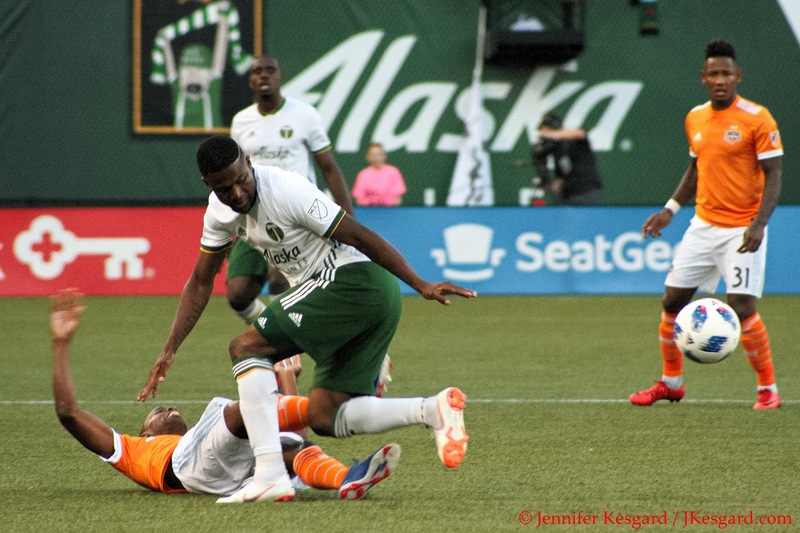 Adi has been one of the most accomplished scorers in his tenure with Portland, but with the emergence of Armenteros and potential of Ebobisse and Langsdorf, the Timbers have been looking at short term and long term options for their club. The team acquired Cristhian Paredes and Andy Polo as building blocks for the now and future, and most recently, midfielder Tomas Conechny was added to the roster, showing the Timbers' resolve to constantly trying to improve their roster. With Armenteros out due to injury, it was Dairon Asprilla up top at forward. Moments after the starting lineups were announced against Houston, the news broke that the Timbers had found a trading partner for Adi but due to various absences, Adi would be available to play against the Dynamo and thus be part of the gameday eighteen. Armenteros strained his back during midweek training and ended up on the injury list as questionable, but the options became thinner with seeing the Timbers 2 starting roster against the Los Angeles Galaxy 2 earlier in the day when Ebobisse and Langsdorf were listed among the game day starters there. Savarese decided to tweak his approach by employing a 3 defender - 5 midfielder - 2 forward attack with Jeff Attinella once again in goal. On the three man back line, he used Lawrence Olum, Larrys Mabiala and Julio Cascante while also starting Zarek Valentin and Alvas Powell as full backs; when on defense, Valentin and Powell would track back to help the backline, but otherwise, they would push forward as outlets and support the midfield on offense. For the middle, it was the trio of Diego Chara, Andy Polo and Sebastian Blanco, with Mr. Chara more anchored in his familiar central pivot point and Polo and Blanco flying outside with Powell and Valentin in support. Up top, the duo of Diego Valeri and Dairon Asprilla would get the start, but Adi would be available as a sub if needed. Savarese could also employ Vytas or Bill Tuiloma as defensive replacements, Cristhian Paredes, David Guzman or Andres Flores as midfield subs or Jake Gleeson as the goalkeeper reinforcement. Houston, meanwhile, was dealing with their own lineup issues after their own schedule compression. The Dynamo had played one of the legs of the Texas Derby in hosting FC Dallas on July 21, and followed it up with hosting the Philadelphia Union midweek at home. The Union pulled off a huge upset by a 3 to 1 tally as they have started to find their way, but in the process during the match, the Dynamo lost 2 players for the Timbers match due to accumulation penalties, midfielder Darwin Ceren and defender Alejandro Fuenmayor, due to cautions. They nearly lost another midfielder, Tomas Martinez who was another key offseason acquisition, due to a red card in the 59th minute in the Union match for a hard foul, but Houston appealed the ruling and the red card was rescinded by the MLS disciplinary committee. The Timbers got another break when Dynamo Coach Wilmer Cabrera held the team's leading scorer, Mauro Manotas, out of the match to keep him fit, but with Martinez now available, Houston was still very dangerous with Alberth Elis, Romell Quioto, and Andrew Wenger all in the lineup. While Ceren wasn't available, Cabrera still had Oscar Boniek Garcia and former MLS Timber Eric Alexander patrolling the middle. Houston has traditionally been very good at home playing in familiar conditions, but they've been consistently inconsistent playing away from home in their history. Alvas Powell & DaMarcus Beasley battled all night, but Powell held up well. Fans barely had time to settle in to their seats before the home side went up early. The first few minutes saw both teams struggling to find the final pass, but in the 7th minute, Powell had put a cross heading towards the South Deck on the right intended for a charging Asprilla on the spot. The ball ended up being too high for Asprilla and no Dynamo defender or Houston goalkeeper Joe Willis could collect the pass before Blanco ran to the ball on the left flank of the box. Sebastian briefly settled the ball before slamming it into the upper right corner of goal, and just like that, the Timbers were off and running. However, the Dynamo found room to work, and in the 12th minute, Elis caught Cascante mishandling the ball in the Timbers end and stole it away from the centerback with the Timbers defense slight in numbers. Elis ran up the right flank to draw the defenders, and then dropped a pass to a wide open Quioto on the right post for an easy tap in goal, and suddenly whatever momentum the Timbers earned from their first goal was effectively neutralized. 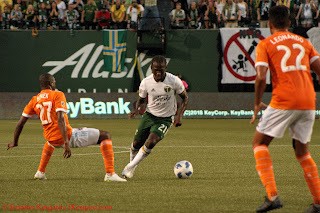 The rest of the half saw the two sides execute the back and forth strategy like a chess match, although the Timbers had the best chances in the 20th and 22nd minutes courtesy of Asprilla. Dairon took a Blanco chip pass off a Powell cross into space on the right in the 20th minute, forcing Willis into a quick reaction one hand save on the shot, and 2 minutes later, Asprilla put a bicycle kick shot off a deflection of a Valeri cross right at Willis, and the rebound caromed to Olum, who was forward on a set piece. The Timbers center back was able to get his head to the ball, but the shot was right to Willis for an easy catch. Houston was playing a very physical style of play, and Center Official Nima Saghafi was very busy in calling fouls with 20 infractions total between the two teams, charging 13 fouls to the visitors. Saghafi also issued 5 cautions in the first 45, giving Powell and Blanco cards for fouls while Asprilla earned a card for dissent. Houston was only cautioned twice for infractions on defender Jared Watts for a foul and Elis for dissent, but the whistles and constant fouls were playing havoc on the match tempo. Savarese didn't make any adjustments to his team at the break, especially considering Portland had the more consistent chances on frame, but with Houston still hanging about on the scoreboard, it was important for the Timbers to come out firing in the second half to earn a goal. To his credit, Cabrera didn't have much firepower off the bench scoring wise, but the Dynamo appeared to be satisfied with drawing the points at the break. Houston tried to sneak in a goal as the second half started when Elis received the kickoff, slipped by the defense and challenged Attinella with a low angle shot that the Timbers keepers pushed away from the goal. Sebastian Blanco tallied his 6th goal of 2018 off an Alvas Powell cross. Unfortunately for Houston, Elis' effort would be their only official shot on goal in the final 45 minutes as the Timbers turned up the pressure on Willis. Valeri and Blanco combined on a lovely give and go in the 53rd minute off a throw from Powell, but Willis was able to break off his line to stop the threat. Blanco and Valeri had several blocked shot over the next 15 minutes until Mabiala headed the second of 2 consecutive corner kicks on frame, but Willis was able to catch the ball. It was at this point where Savarese made his first substitution, and ironically enough, it would be Adi getting the call to replace Asprilla in the 75th minute. Fanendo received a massive cheer during the lineup announcements before the match started, but the reaction was huge when he entered as now most everyone in the stadium knew about Adi's trade. Five minutes later, as if it had been scripted, the Timbers got their second goal in dramatic fashion. Blanco drove down the left flank off a pass from Valentin after Blanco gave the Timbers defender a pass at the top of the box. With Dynamo defender Leonardo giving chase to Blanco to the touch line, Blanco held the ball in play as the defender slid out of play, and he put a cross to the right intended for Valeri. Diego bumped the ball to the middle where Polo tried to take a shot, but it was scuffed into the middle where Adi was standing without a mark, and he quickly chipped it past Willis to tally his 54th career goal in MLS play, and his 3rd goal for 2018. The celebration went over to the corner near the Timbers Army, and every Timbers player went to Adi to help him celebrate the goal. It was revealed after the match that the Timbers' players knew a trade involving Adi was imminent, and so everyone, including Savarese, were indicating that Adi would score in his final Providence Park appearance as a Timber. While Polo just missed a few minutes later on a shot, the time finally wound down and the Timbers could embrace the victory. The result extended their unbeaten streak to 14 matches, but that accomplishment paled in comparison to giving Adi a proper sendoff. 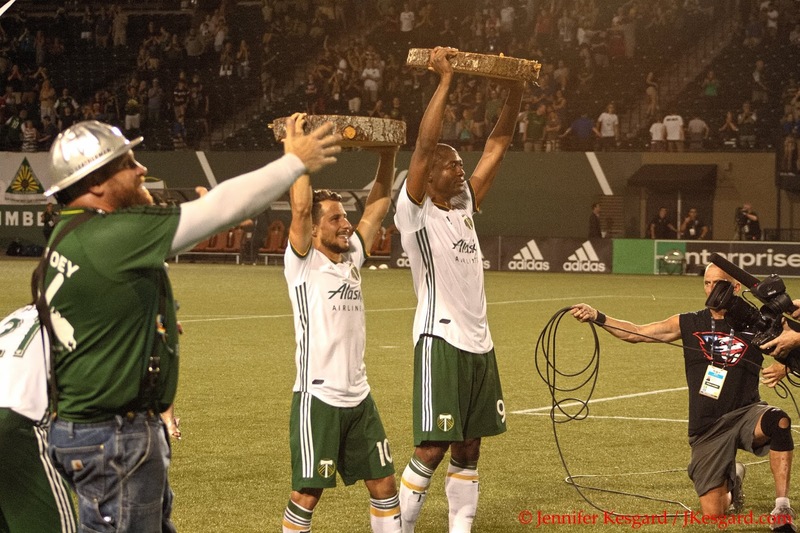 Fanendo received his final log slab after the kickoff, and then he proceeded to head to the capo stand to celebrate and hug several Timbers fans after the result. It was a touching and emotional farewell for a player who was a key component of the 2015 MLS Cup side, and has been one of the more accomplished scorers in MLS over the past few years. It was days later when the team finally revealed Adi's destination, as Fanendo was traded to FC Cincinnati, who is joining MLS in 2019, for general allocation money, and targeted allocation money for 2018 and 2019. Portland will also receive a share of funds should Adi be traded outside MLS before the end of the 2020 season, while the move frees up a roster spot and Designated Player slot. Rumors persist that if Portland wants to keep Armenteros, they will likely need to use the designated player rule to do it, so this move opens up that possibility. The midfield was much more composed with this guy about. For my credit, Fanendo Adi was not only one of the best scorers I've seen over the past few years, but he has also been extremely cordial and giving of his time to the media. I also appreciate his perspective during various interviews, because he produced several thought provoking and meaningful quotes. I appreciate everything that he has done for the Timbers in his five seasons here, and I wish him the best in his new chapter helping FC Cincinnati in their inaugural season next year. However, I don't want to wish him too much luck when he eventually faces the Timbers. As much as it was sad that this would be the last time Adi would be running about on the Providence Park pitch in Timbers colors, I viewed the post game more as a celebration of all that Fanendo has accomplished in his time here. Portland now turns their attention to the aforementioned Union, who visit the Park on August 4 in the third of the Timbers' four match home stand. Portland also remains undefeated at Providence Park with 6 wins and 3 draws in 9 matches played, which is 1 of 4 unbeaten sides currently in league play (NYCFC, FC Dallas and LAFC being the other three teams).